Matt W. Courtney holds a graduate degree in Mind, Brain and Education from Harvard University and works at the Massachusetts Institute of Technology Center for Biomedical Innovation. 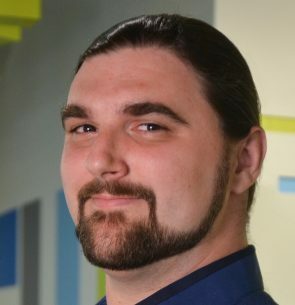 In addition to this, Matt helps out at the Harvard Visualization Research and Teaching Laboratory, is a Virtual Reality Specialist at Harvard Cabot Library, and continues to assist in research on augmented and virtual reality conducted on campus. In the recent past, he was a Teaching Fellow for statistics at Harvard Graduate School of Education. Prior to moving to the Boston area, Matt lived in the Midwest and was very active in the music, arts, and entertainment industry. After earning his undergraduate degree in Cognitive Psychology/Cognitive Science, Matt was fortunate enough to survive as a starving artist/jazz musician for over a year before getting a day gig as a librarian. During this time, he co-founded a production company, which now resides in Nashville, TN, and has coordinated a plethora of art shows and concerts including weekend festivals. Matt has also toured a chunk of the country with a rock band and earned endorsement deals for a great number of products including Washburn guitars, Digitech pedals, and David Eden amplifiers. Since moving to Boston, Matt has become a huge advocate for AR/VR technology and is convinced AR is the next wave of computing. He still loves libraries, writes music, paints, and even dabbles in event coordination from time to time. The most notable of which being “A Conversation with Noam Chomsky and Howard Gardner” held at Harvard University.